I’ve never eaten Filipino food before, so I was really pleased when I read Immaculate Infatuation’s review of Maharlika, a brand new restaurant on 7th St. Originally a pop-up brunch spot on 12th street, they’ve finally got their own space & are serving dinner 7 days a week & brunch on the weekends (lunch service coming this week). It was early on a Friday afternoon & besides an older gentleman we were the only customers. We arrived during happy hour so beers were only $3 (there is a cocktail menu too). The menu is split into sections; small plates designed to be shared, sides, sizzling plates (pretty self-explanatory), plates with garlic rice & egg and finally main dishes with white rice. Most had names that I didn’t even attempt to pronounce, but were described well. 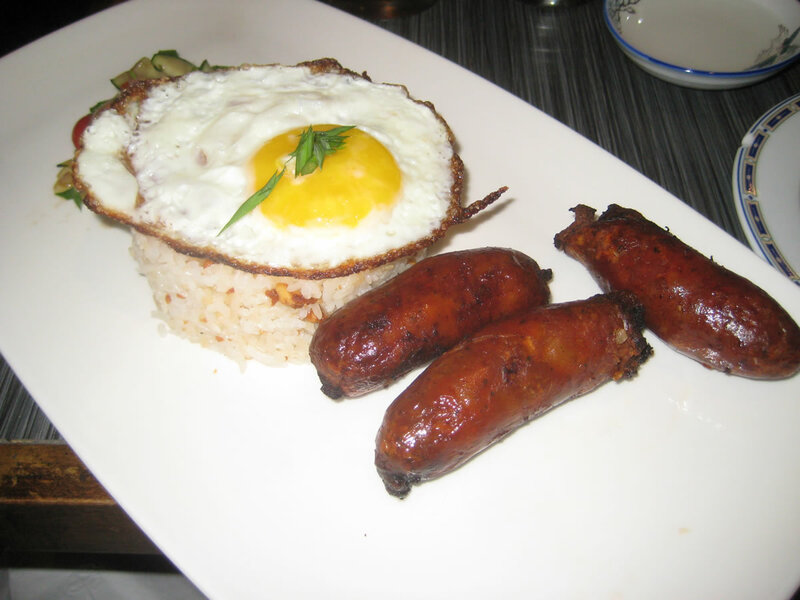 Dan got the Longsilong: 3 grilled Longanisa sausages (garlicky & slightly sweet), salad (partially hidden by the egg in this picture) & garlic rice topped with a sunny-side up egg. I tried the sausage & it was pretty good. Judging by the way Dan scraped his plate clean, I think he enjoyed this dish. Any restaurant that serves fried eggs with dinner already gets brownie points in my books. Based on the review I read, I pretty much knew what I wanted. 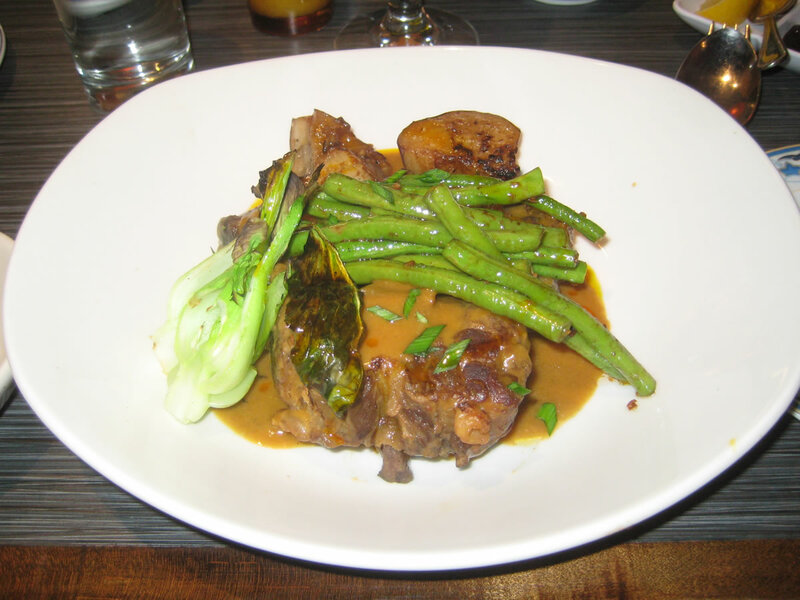 I went straight for the Kare Kare; A mound of Oxtail that has been browned, braised, then finished in the oven. Topped with an amazing, thick, peanut sauce & sides of string beans, potatoes & baby bok choy. Peanut Sauce? you might say & I thought the same thing, but it was delicious. I’m used to oxtail that has been braised for hours & falls off the bone, so this was a new style for me & it totally worked. My only gripe was that in true Filipino style, they don’t use knives & it was hard to extract all the meat from the crevices. 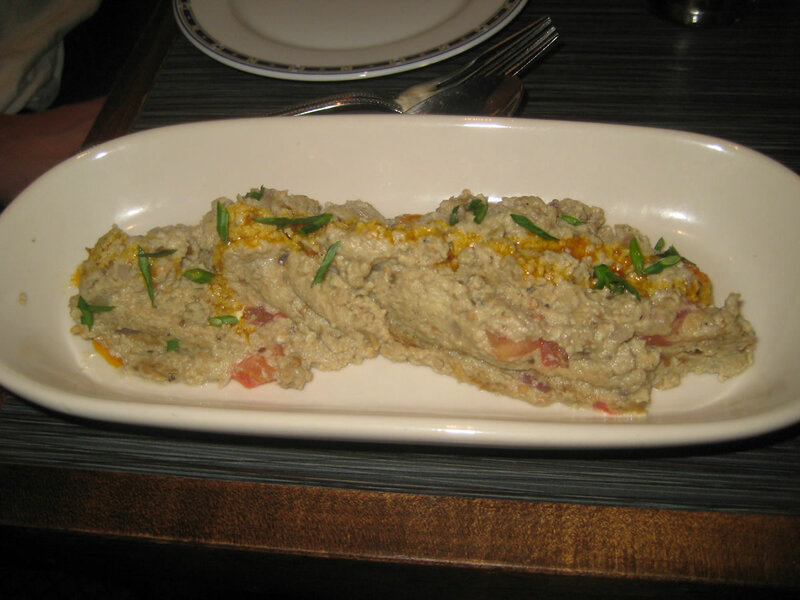 I ordered Puqui Puqui as a side to share, basically roasted eggplant that was mashed, spiced & topped with tomatoes. Simple yet delicious. The folks at Maharlika are big on condiments, before our food arrived, four sauces were brought out & our waiter gave us a crash course in Filipino customs & how each sauce is used. 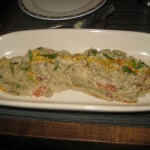 My favorite was a paste made from ground shrimp shells. It was seriously flavorful, but you’re meant to cut the overpowering taste with lemon juice. It was a perfect addition to the delicious peanut sauce that my Kare Kare was drenched in. There was one fish sauce in a commercial bottle that was way, way too salty, our waiter told us it that the Filipino take on Soy Sauce. When mixed with lemon juice it was pretty good though. 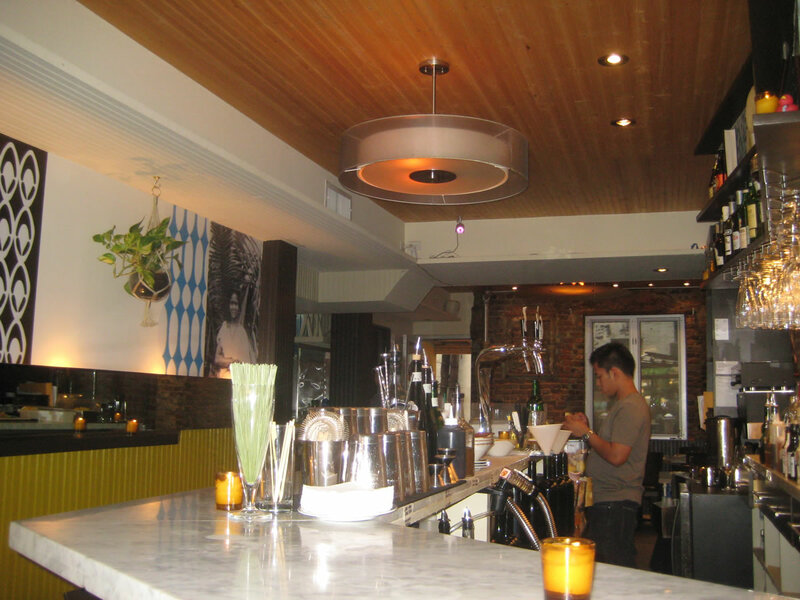 The space was formerly occupied by Lingua, an ‘Italian Tapas’ joint. It’s open, but the tables can get a tad cramped as the plates & condiments pile up. Obviously things didn’t go that well for Lingua, but I wish the guys at Maharlika all the best & they will be getting my business regularly. I’ve only scratched the surface of the full menu, so expect further reviews in the future! Maharlika: 111 First Avenue at 7th St.
Big on condiments? Now that’s speaking my language. Never got a chance to try this place out when it was a pop-up on my block, but definitely have to head there now.